Hicks and Wight with their North Side memorabilia, 12/8. North Side High School’s Alumni Association is partnering with Purdue University Fort Wayne and the Allen County Public Library on an archival project to honor the school’s 100th anniversary. Dr. Ray Beights graduated from North Side in 1962, and now serves as the president of the Alumni Association. “We came up with the idea to create a book of memories, where alumni would be invited to come and share their favorite memories, to bring their memorabilia, where we could take photos and add those to the book of memories,” said Beights. The events are called “history harvests,” and the first took place at North Side on Saturday. Beights says while the goal is to document the items and stories for publication, they wanted to connect with alumni a bit more. “Some of the interviews we hope to put on QR codes, and then we’ll print them into the book so as a person looks through the book, they can scan the code and the person in the book will come back to life and share their favorite memories,” he said. Beights praised his partners on the endeavor, notably Purdue’s Public History Program. In addition to alumni and staff, students of both North Side and PFW are collaborating on collecting the interviews and memorabilia, and archiving all of it. “I want our students to be able to help create this community of record on their own, because this gives them kind of the first-hand experience as to what it actually means to create something seen as historical,” she said. Sharon Wight and Daniel Hicks were on hand Saturday to share their stories for the record. 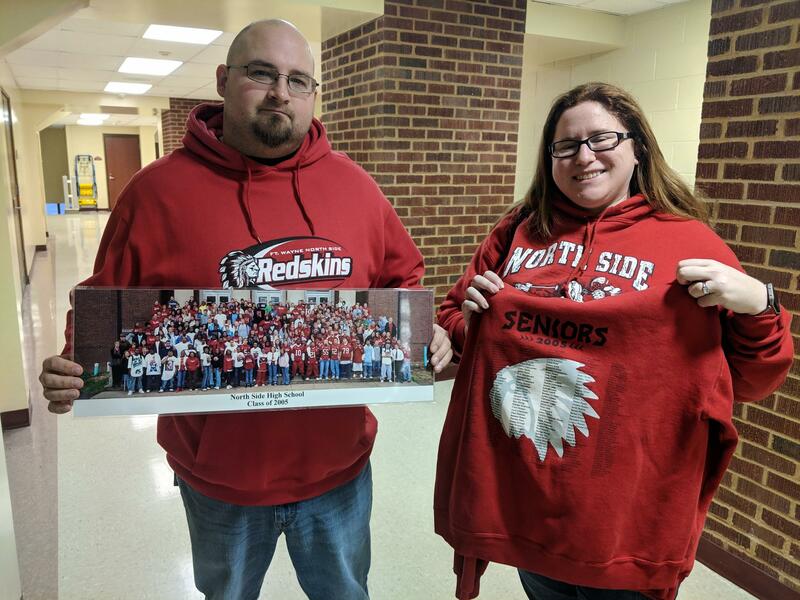 They graduated from North Side in 2005… then got married shortly after. Suffice it to say, North Side is very important to them. “It’s just a really special place to both of us,” Wight said. This time, they brought a laminated version of their class photo and their class sweater, with names of all the graduates on the back. They shared their story for the book, as a way to preserve their own history, as well as part of North Side’s bigger story. “History is something that’s just so important, especially with the changes that happened during the time that we were here, we know how quickly history can change and things can kind of be wiped away and that kind of thing,” she said. “Yeah, because our experience is so much more similar to people from the fifties, and that was 55 years later, but the kids today have an experience so different from ours and that was ten years ago,” he added. Three more history harvests are scheduled on January 29, February 23, and March 23; all of the events take place on Saturdays from 10 am to 4 pm, and alumni are welcome with their memorabilia. Wooley predicts the project could be ready for publication in a year or two.